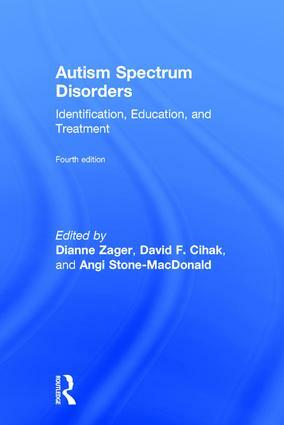 The fourth edition of Autism Spectrum Disorders: Identification, Education, and Treatment continues the mission of its predecessors: to present a comprehensive, readable, and up-to-date overview of the field of autism; one that links research, theory, and practice in ways that are accessible to students, practitioners, and parents. During the last decade, autism spectrum disorders (ASD) have emerged as the fastest growing developmental disability, and, in response to the dramatic increase in diagnoses, diagnostic criteria in the newly published DSM-5 are significantly different than they were in the DSM IV-R. The structure, content, and format of Autism Spectrum Disorders, 4th Edition have been revised to accommodate changes in the field and to illuminate the current state of the art in the study of autism. New information on early identification, transition education from adolescence through to adulthood, neurobiological research, and technology-based solutions is included. "The fourth edition of this widely used textbook on autism provides significant new improvements and updates, making it a must-read by everyone working in this field. Using a research-to-practice approach, the new edition includes an updated discussion of practices in transition, employment, and technology usage. The range of topics covered and the expertise of the contributing authors make this edition an exceptional volume for anyone interested in persons on the autism spectrum." "This book is a comprehensive resource for educators, researchers and other practitioners in the field of autism. The editors assembled an impressive array of experts and the result is an accessible, evidence-based, and well-organized guide to best practices for students with autism. I highly recommend it to my colleagues and students." Dianne Zager is the Michael C. Koffler Professor in Autism in the Dyson College of Arts & Sciences at Pace University, USA. David F. Cihak is Professor and Special Education Program Coordinator in the Department of Theory & Practice in Teacher Education in the College of Education, Health & Human Sciences at the University of Tennessee, Knoxville, USA. Angi Stone-MacDonald is Associate Professor in the College of Education and Human Development and Early Childhood Licensure Program Director of Early Education and Care in Inclusive Settings at the University of Massachusetts Boston, USA.